Chief Chirpa is a Star Wars minifigure based off the character from the Star Wars movies with the same name. Chief Chirpa was an Ewok native to Endor. He was the Chief of the Ewok village and the uncle of Paploo. He has appeared in two sets. Chief Chirpa has so far been released in two variations, the first of which was included in the set 8038 The Battle of Endor. Chief Chirpa came with light grey small legs, a light grey torso, light grey arms, dark grey hands, and an exclusive larger than normal head piece. The head piece depicts the light grey Chief Chirpa wearing a brown colored hood, having two black eyes, two ears, and a furry face and body. Chief Chirpa came with a Staff. Chief Chirpa was an Ewok native to the forest moon of Endor. 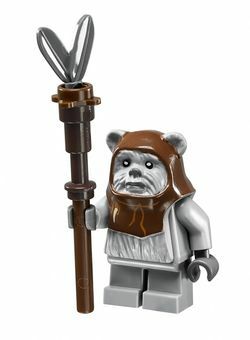 He was a grey skinned Ewok who was the chief of Bright Tree village, the same village Wicket and Paploo, his nephew, inhabited. He had grey fur and wore a brown hood. When the rebels came to the planet to destroy the Imperial Shield Generator, which guarded the Death Star, Chief Chirpa ordered his tribe to kidnap some of the rebels. After succeeding, the two sides eventually came to an understanding that they must work together to stop the Empire. Thus the Battle of Endor began. The Rebels and the Ewoks defeated the Imperial planet forces and destroyed the Shield Generator, allowing the space forces to destroy the Death Star II, resulting in the defeat of the Empire.